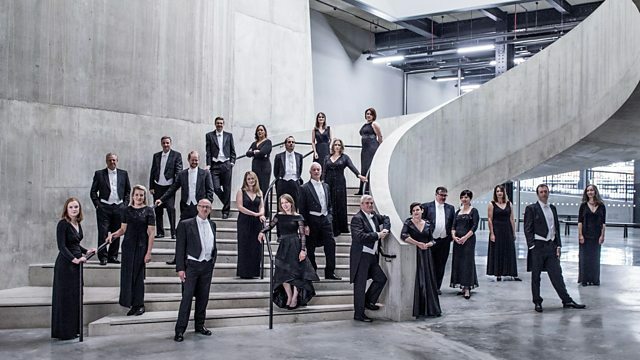 The BBC Singers and conductor Michael Zaugg perform the world premiere of Rory Boyle's Songs from the Marshes as part of the 'JAM on the Marsh' festival in Kent. The BBC Singers perform one of the greatest of choral works, Rachmaninov's Vespers, first performed in 1915, as part of the JAM on the Marsh festival's commemoration of World War I. Canada-based, Swiss conductor Michael Zaugg makes his BBC Singers and JAM on the Marsh debut conducting the Rachmaninov and a world premiere, Songs from the Marshes, by Scottish composer Rory Boyle. This Festival Commission has words about the Romney Marsh, Kent and local community by the outstanding poet, Claudia Daventry. Performer: BBC Singers. Performer: Michael Zaugg. Performer: New London Chamber Ensemble. Singer: Ashley Riches. Performer: Anna Tilbrook. Performer: Cappella Romana. Performer: Alexander Lingas. Singer: Theodor Dumitrescu. Singer: Rebekah Gilmore. Author: Alexander Blok. Choir: Moscow New Choir. Conductor: Elena Rastvorova. Sviridov: Songs of Troubled Times.